There are very few races I can’t bear to miss, and the Karapoti Classic is one of them. The 50km race in Upper Hutt, New Zealand, is the Southern Hemispheres longest running mountainbike event, and one of the toughest, with three massive climbs, nasty rocks, shoe eating bogs, ruts, river crossings, slippery singletrack, and did I mention rocks? It is also the the world’s longest running Muni race, with a unicycle category since 2003. 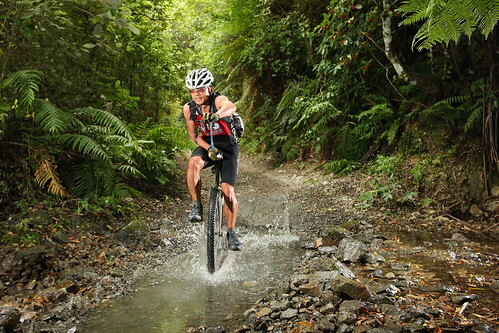 For someone who grew up in Wellington, Karapoti is part of local mountainbike folklore! I now live in Australia, but have been flying back every year to do this race. 3-2-1…go! The traditional scramble across a raging river was fairly tame this year, with the Akatarawa river as low as I’d ever seen it. Still worth taking care and not dunking yourself at the start of a race though! Once on the other side, it was a 2km ride up the road to the start of Karapoti Gorge. This is where high gear comes in most handy. I kicked the Schlumpf into 1.5 mode and cruised with the rest of the ‘special category’ classes- a mix of singlespeed, tandem, cyclocross, and retro bikes. Tim and Sam were riding ungeared 29″ and 26″ unicycles respectively, so would have to make up time on the climbs. I hit the gravel singeltrack of Karapoti Gorge and was pleased to see it drier than most years, and able to be ridden in high gear. The cadence was slower, but I felt I was making good time on the Karapoti record. At the start of the warmup climb, I was 10min ahead of my usual splits…so kept telling myself: ‘don’t stuff this up’! It could be a record year, as the legs were feeling good. After the ‘warm-up’ climb, the real climbing begins, on the never-ending grind up to Deadwood, which also happens to be what your legs feel like at the top. This is where unicycles comes in handy. Being more compact, but not necessarily lighter (despite all the carbon and titanium, the geared hub is a tank), I pass dozens of riders pushing their way up. At the end of the rock garden, the track turned skyward in what is known as the Devils Staircase, with parts so steep you’re scrambling on all fours. Luckily, this year was fairly dry, which meant no one sliding back down toward you, and their bike landing on your head. The drink station at the top was welcome relief. After grabbing a handful of jet planes and jelly snakes, which everyone had dunked their grubby mitts into (who cares about hygiene), it was off down the 10km long ‘Big Ring Boulevard’. Not quite a big ring, but I flicked the unicycle into high gear, doing my best to avoid loose off-camber sections and ruts which made this section deceptively difficult. Riders were scattered along the track fixing punctures from high speed impacts. I cranked along in high gear until both legs cramped, and I ended up on the side of the track for 5min, with another rider straightening my feet. The added torque was taking its toll, and I kicked myself for not fitting a handlebar for extra leverage. I was starting to lose time, and I wasn’t happy about it, so went back into low gear to spin off some of the lactate. During that incident my watch had ripped off, but after a cursory look, I had to get back on the Uni to try to catch Tim, which I did just before the start of the the Pram Track- arguably the toughest climb of Karapoti. I decided to powerwalk….it was faster than riding after what my legs had been through. Trying to keep Tim in sight however, was impossible, as he flew up the track as fast as his legs would take him. I don’t think I have ever seen someone disappear up the pram track as fast as he did. The race was now on, as most of the time would be made on the climbs. When we hit the top, Tim was nowhere in sight, and without my watch I couldn’t keep track of race time. On the other hand, taking risks down Dopers Hill is not something you want to do, with the steepest part of Karapoti to come. At the bottom of Dopers, a track official said Tim was just a minute ahead, so I cranked back into high gear and pedaled as hard as I could. I caught sight of him just before the start of the Karapoti Gorge, and upped the pace some more, only to wipe myself out again. I took it fairly gingerly down the Gorge after that, but managed to catch Tim again halfway down. This was the home straight, so I enjoyed the last rocky single-track and eased my way down the road to the finish. After another river crossing (I cramped in the middle and ended up swimming), and it was up the finishing shute and across the line in 4hrs36min. Not anywhere close to the record, but happy to finish. Tim rolled across the line a few minutes later in 4hrs39min, and Sam completed his first ever Karapoti in 5hrs3min, not a bad effort!